Hera Hilma is currently in London promoting her new film 'Mortal Engines' and her stylist Rebecca Corbin-Murray posted her look to her intstagram page yesterday(November 27th). 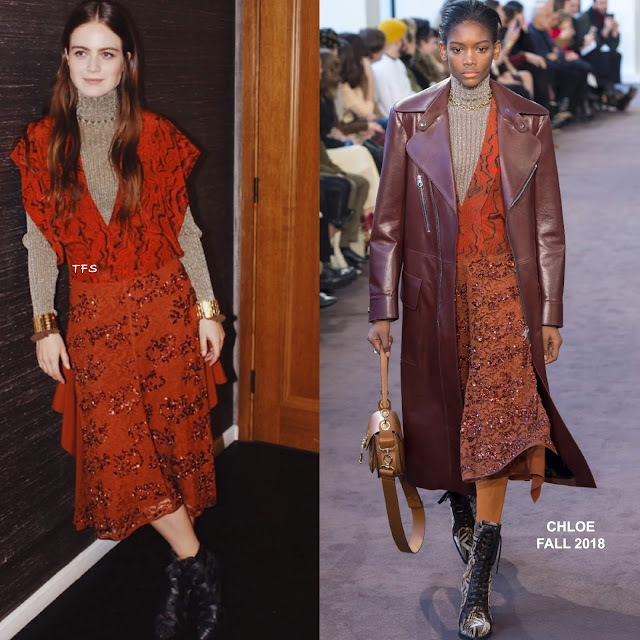 She posed for the gram wearing a CHLOE FALL 2018 shimmery ribbed taupe turtleneck and a printed color-block, lace embellished calf length dress. Rowan Blanchard wore dress first but with a different color turtleneck. Keeping to the styling tone of the runway look, she toughen up her ensemble with black leather boots. Accessorized with gold cuffs, she finished up with center part, light waves. Are you feeling Hera's instagram style?